Adding a few Fall touches to the front of the house adds such a welcoming touch to a home. What Kind of Style is Your Porch? You can read more about our outdoor projects here. Is it Worth the Money to Hire a Landscaping Company? 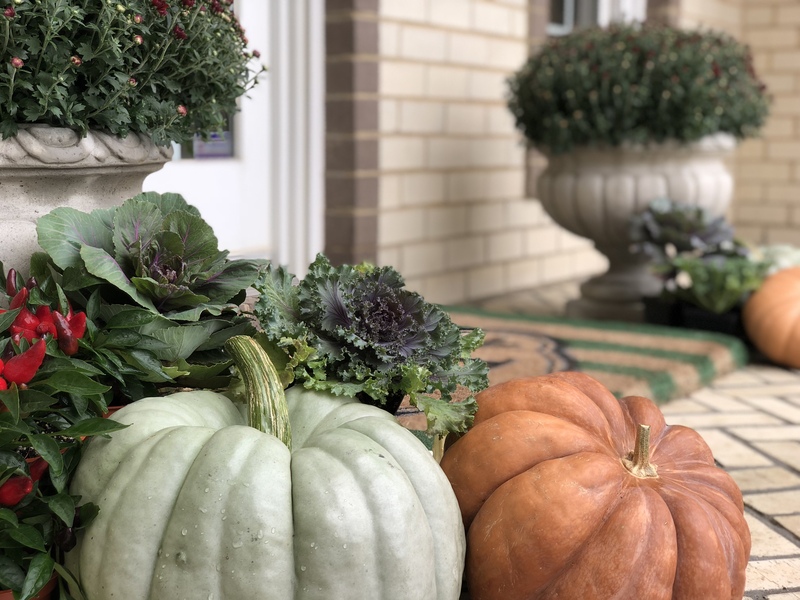 When is comes to styling our front entrances, life would be much easier if we had multiple steps leading up to the door, so I could have a beautiful cascading effect and decorate each step with loads of mums and pumpkins. But I don’t, we have one step leading to the front and side door, creating a styling dilemma. I feel that my entire house is a plethora of styling dilemmas so why would my front porches be any different? 😉 The extra challenge makes it a bit more fun, right? I started styling the porch at the highest point of the space, the door. I added a colorful wreath from Home Goods with rich velvet pumpkins, pinecones, acorns, and leaves. I attached the wreath to the door using these hooks HERE. They work so well, I use them all year long especially around Christmas to attach anything and everything to anything and everything. Moving downward onto the next layer, the planters. When you have a flat porch or one with just a single step, it’s important to frame the door as much as you can. I have 2 planters in front of the door that are used to add height to the frame. I am using mums in the planters, but you could also use corn stalks or pumpkins stacked on top of each other. I feel that no Autumn porch is complete without Mums, whatever the color, yellow, orange, or red, every porch should have at least one of these Fall favorites. I found my Mums at our local nursery. These 10 inch potted flowers are the perfect size for my cement planters. Now that I have created height with the mums in the planters, I added a couple different layers of cabbages, pumpkins, and peppers. The idea is to create different levels and multiple layers, starting with the tallest layer first. You can add plants to various pots or pails creating differing heights. Heirloom pumpkins are my favorite type of pumpkin. Their unique varieties make them perfect elements to create an eye catching display. Jarrahdale pumpkins are beautifully ribbed, and have a blue to gray-green skin with thick orange flesh. They have a long shelf life, making them perfect for centerpieces and decorating. White pumpkins are always beautiful pieces to add to an outdoor styling. The neutral tone makes them suitable in any setting. My other favorite pumpkin is the “Musquee de Provence” also known as the “cheese pumpkin”. It has a beautiful light orange flesh and is great for cooking. Another idea to add to your porch for ambiance, height, and interest are lanterns HERE. A mat is another lovely addition to a porch or entrance. Our outdoor coco mat from Frontgate is holding up well and the colors look great in the space. You can read more about our french urns and mat HERE. What ever style of entrance you have, one with steps or one without, layering elements with different colors and textures will work everytime. Here are a few other Fall posts you may enjoy. Christmas is right around the corner..you may want to check out what Balsam Hill is offering. I ordered 2 Christmas trees this week! Subscribe to Happy Haute Home for more seasonal decor ideas and follow along on Pinterest HERE, and Twitter HERE and feel free to pin and tweet your favorite pics from Happy Haute Home. Great ideas Denise. How does the beautiful wreath stand up to the outside weather without any protection especially the velvet pumpkins? You probably have not had enough time to determine that. I don’t have any protection on my front porch & everything I like to hang on it says “not outside”. I guess just experiment & don’t plan to have it last many years!! Anyway, it’s beautiful Denise. What nursery do you go to? Thank you Donna! So sweet of you to comment! Both my entrances are covered so I don’t have any weather related issues with my wreaths. But as you said, if the weather gets too bad, and the wreath is destroyed, I would toss it, just like we would do with a live wreath. I bet your home is looking beautiful for Fall, you always did have a beautiful way of styling! Hi Donna, I forgot to answer your question about the nursery, I go to Meadow Farms nursery, they have a great selection of Fall flowers.